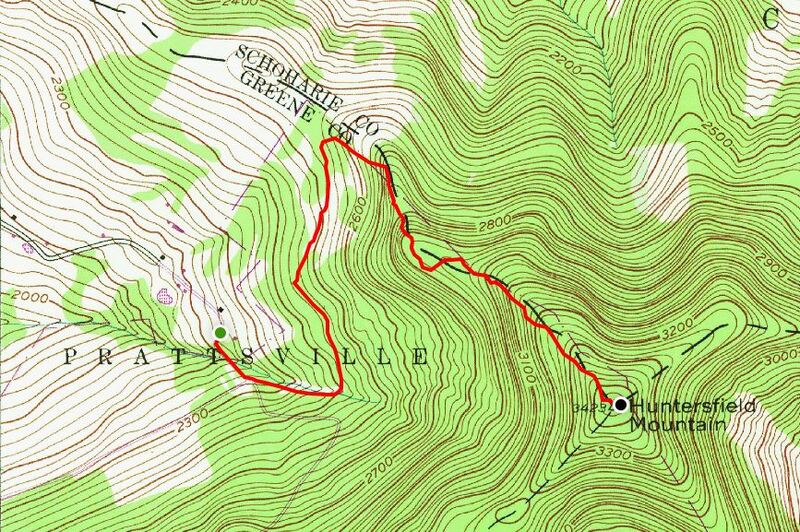 On paper, the summit hike of Huntersfield Mountain seemed fairly straightforward, and not especially arduous. 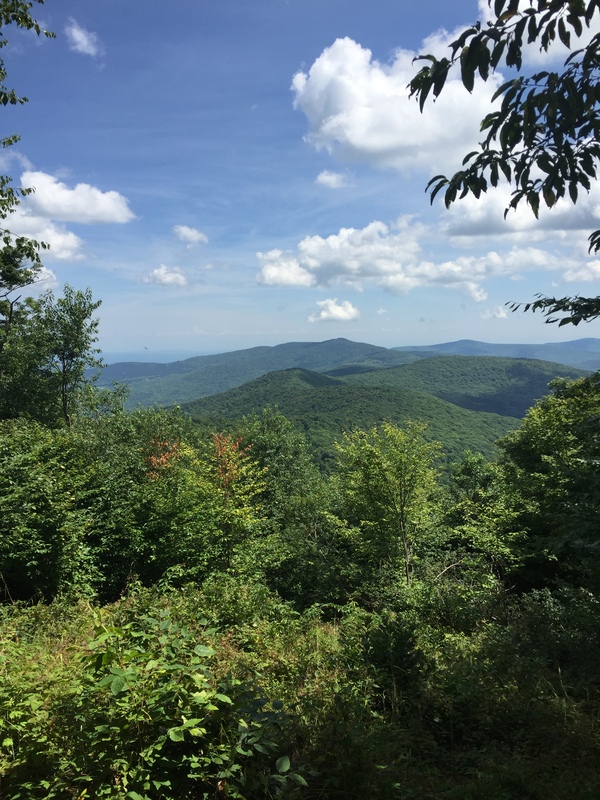 As the Schoharie County high point, I knew I’d be traveling to the northwestern section of the Catskills – near Prattsville, actually – to take on this 3,423-ft mountain peak. Anticipating approximately 2 hours drive to the trail head, I set out at about 9:00am up the New York State Thruway. Exiting at Catskill, NY, I followed Route 23 all the way to and through Windham, NY before finally reaching the turnoff onto the rural road that would bring me out to the western base of the mountain. Parking at the end of the paved section of Huntersfield Rd, I took to the woods. The first segment was a brief walk on an unpaved extension of Huntersfield Rd, but in less than 2/10 of a mile, I reached a “State Lands” sign, and then made a left onto the red-blazed DEC footpath. At first the path was quite technical, and difficult to follow at times. But after 1/4-mile or so of this terrain, the trail popped out onto what appeared to be an old logging road. Being that this was mid-summer, and the road likely gets very little traffic (pedestrian or otherwise), it was very overgrown, and even a little swampy in places due to recent rains. Soon I came upon a sensational grove of tall white pines, which dominated the entire right side of the road. It occurred to me in that moment that these pines did not all grow here naturally. Perhaps – I opined silently – these gems had been planted a few generations ago on what had been farmland here at the mountain’s base. But now, they stood marvelously tall and proud, several thousand of them all together, as if forming a wall of protection from those who might have ill intentions toward this special piece of the Catskills. 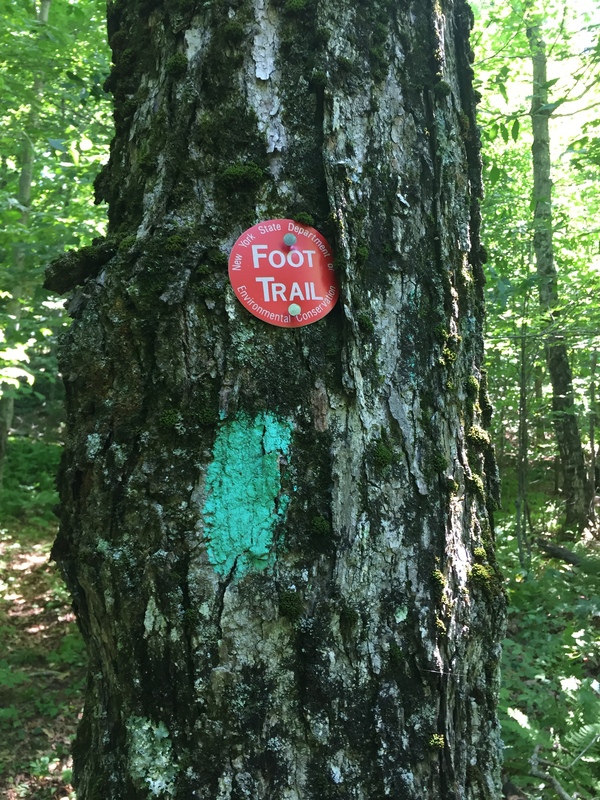 At the 1-mile mark, the red trail blazes pointed to the right, and took me straight through the heart of the pine forest. The bed of pine needles beneath my feet was quite sublime. Now coming onto the shoulder of the mountain, I began the 1,000-ft ascent that would bring me to the summit ridge. Along the way, it was a mixture of 4 or 5 steep sections, followed by brief plateaus, which gave me a break and let me regain my wind. was clearly of the Catskills variety. 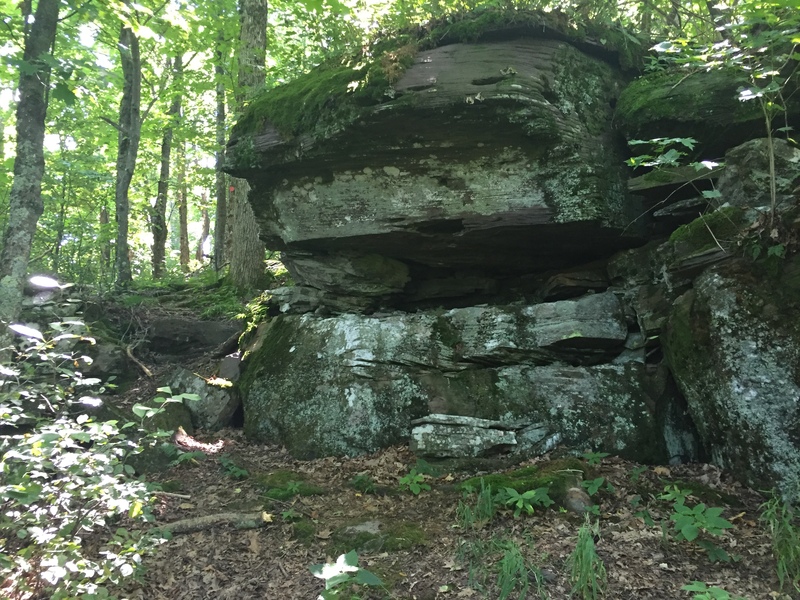 About halfway up, I strode past a cave-like den in a huge, layered boulder, and thought it a great place for a small forest creature to take refuge during a storm. As I began to see more bits of blue sky in front of me than above me, I knew I was nearing the mountaintop. here by a Long Path blaze, and I realize that I had unknowingly stumbled upon an abandoned section of this epic 357-mile hike path. quickly reached the Huntersfield Lean-To. There was also a nice viewpoint here, and I decided it was a good place to plop myself down and lunch on the cheese and cashews I had brought along. In what would seem to perhaps many of you as paradoxical, I played an Alice In Chains Pandora station on my cell phone as I ate. I also signed the lean-to’s register book, and as I reviewed prior entries, saw two names that I knew (which was pretty cool). I also noted that only 20 parties – most consisting of just one or two people – had signed in here in the past two months. Yes indeed, the Huntersfield Mountain trails would seem to be quite underused. 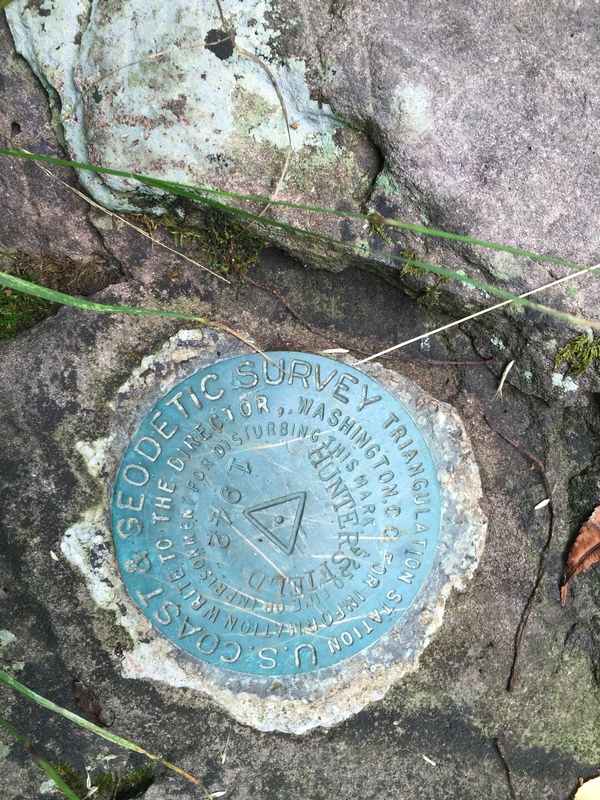 After lunch, I found my way back to the red trail junction, and perhaps 20 meters onto the trail, I encountered the Geodetic disk that often marks the official summit of a mountain, or high point of a region. I took a brief picture of it, and began the descent, which was easy going and delightful. 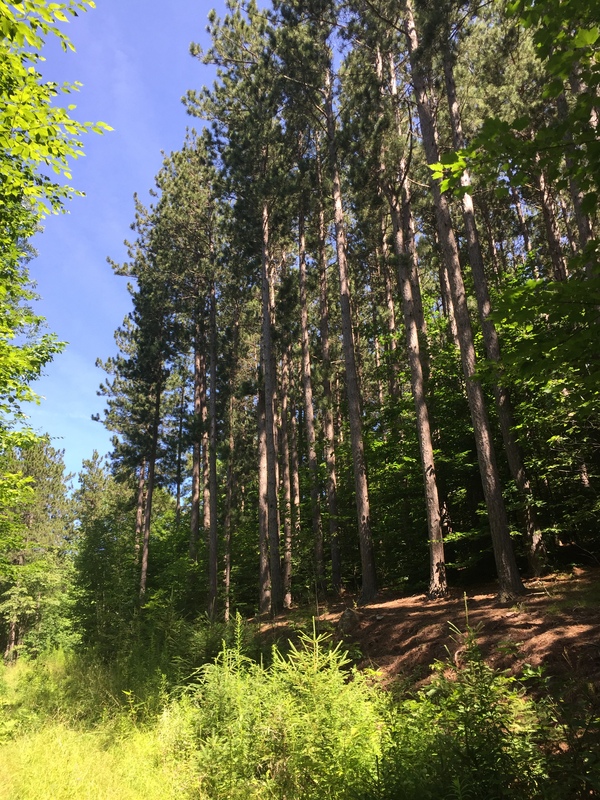 I waived goodbye to the pine tree grove as I left the woods road and began the final 1/4-mile trail segment back to Huntersfield Rd. I felt especially joyous as I reached the car, and quickly hopped in to get the A/C going on what had become a fairly warm early-August afternoon. My next stop on the way home would be Cave Mountain Brewing Co. in the village of Windham, where I would have my celebratory craft beer, and starting making plans for the next county high point summit day. 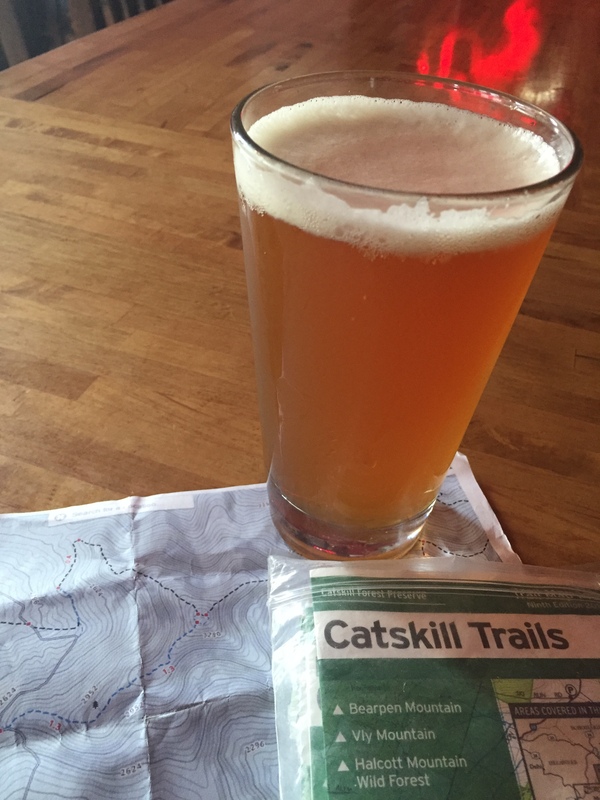 This entry was posted in Trail Running and tagged Catskills, Cave Mountain Brewing Company, Huntersfield Mountain, Long Path, Prattsville, Schoharie County, Windham. Bookmark the permalink.